1 edition of Liadain and Curithir found in the catalog. Add another edition? Are you sure you want to remove Liadain and Curithir from your list? Published 1917 by B.H. Blackwell in Oxford . Title and series title within illustrated borders. 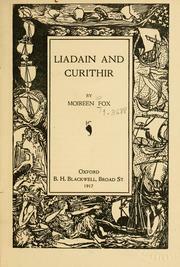 An adaption, in verse, of "Comracc Liadaine i Cuirithir," an Irish tale of the 9th or early 10th century. cf. Foreword. Several of the poems are reprinted from "Poetry (Chicago)" cf. Note, p.
October 17, 2008 Created by ImportBot Initial record created, from bcl_marc MARC record.